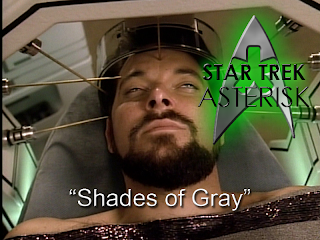 Star Trek: Asterisk "Shades of Gray"
Riker saves Paramount some money getting paralyzed and watching a few episodes of Star Trek: The Next Generation in his head. While surveying a jungle planet, Riker takes a seat on a rock, complaining about his leg hurting. Geordi comes over and takes a look to find that Riker is badly injured, so he asks O'Brien to beam him up, but the transporter says that Riker has an infection that can't be filtered out, so Pulaski has to beam down to take a look. She looks at Riker's leg, confirms that it's okay to override the transporter's safety protocols and beams him directly to sick bay. In sick bay, when Riker goes to sit on a bed, his leg, like the credibility of the episode, dies. Pulaski finds that the infection inside of him was moving from his legs up to his brain and shutting down neurological activity along the way. If it reaches his brain, he will die. 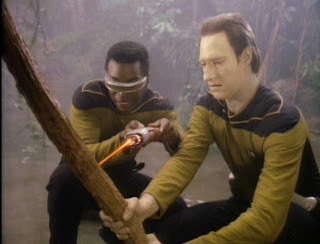 To learn more about the infection, Geordi takes Data down to the jungle planet and finds a thorn on the side of a vine that tried to attack Geordi. 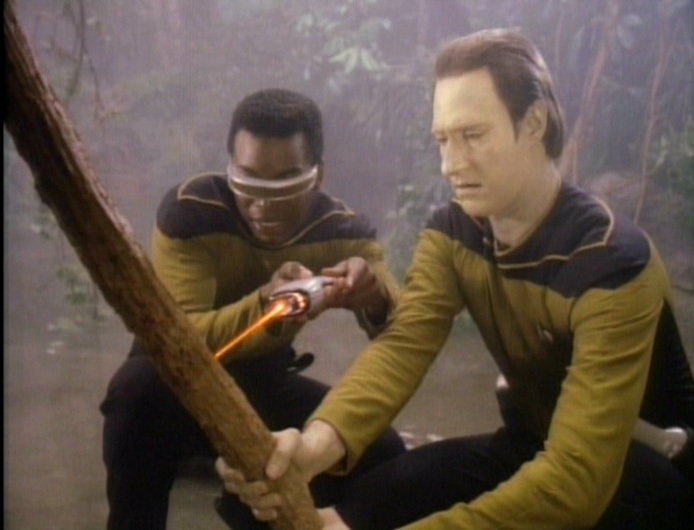 That mixed with a number of dead animal bodies (that we never saw) leads Geordi to believe that THE TREES ARE ALIVE! Well, predatory, anyway. Meanwhile, up on the ship, Troi goes to visit Riker and ~feel things~ from him. With their combined powers, Dr. Pulaski and Counselor Troi find that Riker's emotional state has a deep effect on how the infection spreads. While Riker is dreaming of some happy episodes of the past, the infection is getting stronger. So, through a giant needley head circle thing, Pulaski induces some negative emotions and he starts dreaming of sad episodes or hurtful episodes and the infection slows down. The negative emotions are good, but not enough. Pulaski starts inducing some raw survival emotions which make him dream of explosions and death and they come at rapid fire pacing and eventually this treatment pulls back the infection and Riker recovers. 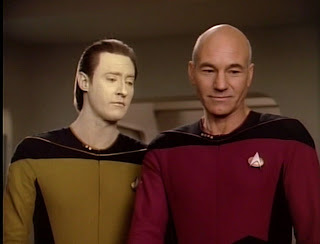 When he wakes up Picard is there with Data. Riker says he's ready to get back to work, but Pulaski insists she has more tests to run to make sure he remembers exactly who he is. "Of course I know who I am," he says, winking at Picard, "I'm Captain Jean-Luc Picard of the starship Enterprise." Playing along, Picard motions to Data and says "The admiral and I are relieved to see you have survived." Data, not getting the joke, questions whether Picard has the authority to promote him to admiral. And a good laugh was had by all. This was literally just an attempt to cut the budget because of going over budget with the Borg. You'll notice I didn't describe Riker's dreams in any detail. That's because we've seen them before. This was a clip show, and the only parts that were original were the parts I described. Not even the writers of this episode liked the episode. It was a very weak way to end the second season, but at least it's over and it'll never happen again.